Do you like to know how to ship a car to Overseas and you are looking for a reliable car shipping overseas company? No matter if you are first-time car shipper or you have shipped cars for years, the rules and regulation are exactly the same when it comes to shipping cars overseas. Efficient, safe and timely shipping of automobiles has become an important need in the present day and in keeping with the demand, USG Shipping Lines offers the best of vehicle overseas shipping services. The process of international car shipping is largely simplified owing to the efficient, straightforward and transparent services offered by this worldwide shipping company. The company possesses expertise in shipping automobiles through airways as well as through the ocean. When you hire USG Shipping Lines to transport your cars, you are having the assurance of safety because a lot of technical expertise and safety measures go into securing the vehicle such that no damage caused to it during transit. The expertly trained staff of the company is well equipped to brace and lock the car in place to make sure that the vehicle is being secured. Our car shipping services are via air and ocean Freight since these are two current modes of shipping cars overseas. Even though cars could be shipped via ocean or air the ocean shipping is the most economical option for shipping cars internationally. The price of shipping car could depend on the type of car, destination, and mode of transport. As one of the leading companies in overseas car shipping, our goal is to find the best option for shipping your cars overseas. We became a leader in international car shipping from Houston, West and East Coast we offer both ro-ro and container service. If you are not sure about the details of your car, you can find the information needed by using the VIN number of the car. USG offers both containerized and rolls on roll off. When transporting cars in the container considered as safest since the vehicle is covered and protected from the sun and any movement during the ocean or rail transportation but the cost for shipping the car via roll on roll off is lower than container shipment. This may change, once you are shipping multiple cars the 40 or 45 footer containers and for multiple cars, the container will become a cheaper option. USG is your reliable shipping car Overseas company and will offer the most competitive rates for that with the car shipping from all the major ports in the USA to any port in the World. Please see below our services for shipping cars overseas. Remember we even We ship cars by Air! Here at USG Shipping, we can ship your car to any International Airports in the World with a service covering the pick up from your door in the USA. Car shipping from the USA and by Air requires the title validation process exactly as when you ship your car via Ocean. Shipping car by Air is one of our best services and such allows you to have had your car within a few days even if the destination is ten thousand miles away and international car shipment using the Air freight allows you to have your personal car wherever you go! Airlines have special packing solution for the classic or new cars which need to be shipped by Air. Some cars are taking two spaces and some others take one and according to that, the air freight rate gets calculated. USG is making sure to use the best Airline base by the rates and service provided when shipping cars by air. We can pick up your vehicle from your door in a specialized dedicated enclosed trailer and transfer it to the nearest airport. Our years of experience in handling vehicles gives us an edge over our competitors as we have a seamless and cost-effective procedure in place. We make sure you get the best possible rate and service, and your vehicle being transported in the safest way possible. Our dedicated enclosed trailers are fully bonded and insured so you have peace of mind. From the time you hand over your vehicle to us until the car arrives at its destination, you're looking at most five to the seven-day procedure including customs clearance, documentation, and export validation. We offer full coverage all risk insurance for your car, so you are completely at ease knowing your car is protected and safe. Our air freight team will give you the rate and complete guidance to make the moving a positive experience, instead of a stressful one. For air freight, once the validation gets completed the airline will load the car in aircraft for shipping. Whether if you have a commercial trade show coming up or you want to import your vehicle to enjoy on your vacation, we can handle the entire transaction for you. We are well aware that temporary import for NON-US spec vehicles is quite complicated and challenging. That is why we offer a complete A through Z service when it comes to temporary import vehicles. We'll handle the necessary paperwork with the Environmental Protection Agency (EPA), Department of Transportation (DOT), and Customs Clearance at the U.S. airport or seaport. Our dedicated team members will get the necessary import approval, so you do not get stuck in your car at the airport/seaport with hefty demurrage and storage charges. The rate for international car shipping could change depending on the origin of your shipment, type of car, mode of shipment and the destination. Also, the rate is always lower if you ship multiple cars. The vehicle if expensive or brand new better to not be lifted in the container. For more details about the validation, please contact us and we will make sure to provide you with the most accurate information for each port. It is mandatory to provide the most accurate information when you fill out the overseas car shipping paperwork. US Customs had the authority to seize your car at your cost if the information provided is not correct. USG is not just an overseas vehicle shipping company, we also import vehicles from many countries. Car transportation to overseas if handled correctly is an easy task but make sure to always provide us with the correct value and other details when you are filling out the car export declaration form. The rules and regulation for shipping Truck and Vehicle are exactly the same. US Customs may take up to 48 hours before validating the title for overseas shipping and in such case, USG can't be responsible if delay from Customs cause a rollover or it misses the vessel. The time around for Customs to process the title of a vehicle is not in our control as sometime there could be a delay from their side due to an internal issue. The Roll on roll off or Ro-Ro is a mode of shipment for the running vehicle where the vehicle will be loaded to the ship either by simply driving it or hooking it. The rate is usually cheaper than container especially if you ship a single car. Car shipping overseas companies are offering mostly shipping services from one place but the advantage of using USG is now we offer the same services from six locations in the USA and few locations in Europe, Canada, and the d the Middle East. We offer cars loading services in Newark NJ, Miami Fl, Houston TX, Long Beach, and San Fransisco CA where the cars need to get safely loaded in the container. Our team will load the cars and make sure to secure them well. For shipping a car overseas you can use the 20 footer which is the smallest container. Due to all the dealership agreements, the brand new cars are not always okay being exported with just the certificate of Origins however for some destination and type of cars you may have the possibilities to ship the new cars. Overseas car shipping companies are not allowed to handle any purchasing transaction on behalf of the client however they can give a draft copy of the bill of lading to the dealership to prove that car is only for shipping overseas. Besides providing an ideal atmosphere for the transit of automobiles, the company takes up the responsibility of arranging all required documentation required for transporting the vehicle. Many countries impose regulations on exhaust pollutants. Such details are available to customers. The bill of lading and all other kinds of paperwork get handled company to make the process easy and hassle-free. A cover letter which includes the name of the vessel, dates of departure and arrival, address, the name of the customer, details of automobile and contact numbers of company agents so that the automobile can easily be claimed at the destination. These are just some of the prices for references to give you some idea of how much it cost to transport your car to the port if you can't deliver the car yourself and the international car shipping cost get added to inland transportation cost. It's good to have the cheapest price when quality is also there! Each year, there are millions of cars being transported all around the world. The USA is one of the major Car exporters in the World. When shipping one car ro-ro maybe a better option but you can't have any items inside the car and the vehicle should run and drive with no visible accident. The title must be clean for the ro-ro carrier to accept. For container shipment, all these requirements do not apply so you can add items inside the car, does not have the same need as far a clean title or being in the run and drive condition. Remember the country where you are shipping your car to may have some other regulations, so you always need to check those regulations before shipping your vehicle overseas. 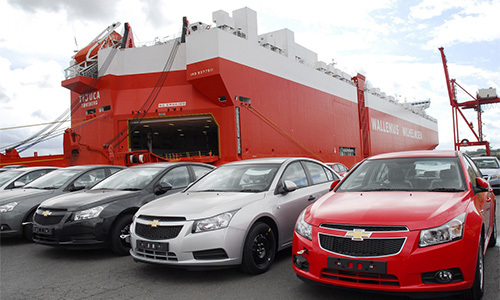 Cars and Trucks are one of the most important commodities in international shipping. - Shipping cars overseas military: For US Military members in different bases either Guam or other places there is a specific process to ship the car. Active military members can enjoy a 10% discount on our ocean freight rate when shipping their vehicles overseas. When shipping special vehicles including armored cars, you need to get the Export license and that's even if you have purchased them from a government auction you should have the license for the overseas shipping. Most of these cars can't fit and be transported in the container so the ro-ro shipping is the most convenient option. US General Shipping offers International Auto Transport services from any locations in the USA or Canada to all the major Port or Airports in the World. Anymore question on how to ship a car overseas, send us an email or give us a call and we make sure to give you the latest information. When it comes to international transportation for Trucks and Heavy equipment the options get limited to either flat rack containers or roll on roll off. The smaller or day-cab trucks could fit in the 40 footer HC. Our inland transportation network will make sure that your heavy machinery and break bulk cargo get transported in a timely fashion from auctions or dealers to the nearest port or warehouse. If you prefer your heavy machines get dismantled, our warehouse network will handle professional dismantling for your machinery and pack it in a container in a safe and efficient way. We handle project cargo and government contract jobs for various industries. Fill free to give us a call or send us an email if you need to ship a vehicle overseas!